Workmanlike but fun - perhaps the best description of both this game and the MCU. 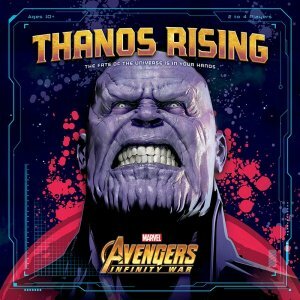 Games like Thanos Rising, USAopoly's licensed title released to coincide with the release of Avengers: Infinity War, present a kind of critical conundrum. I don't think the design is particularly noteworthy in terms of expressing the subject matter and the mechanics aren't particularly compelling. Make no mistake- it's competently written and there is plenty of fun to be had in this mighty Marvel mash that finds virtually every hero in the Marvel Cinematic Universe duking it out with Thanos and his Black Order lieutenants during his bid to collect the Infinity Stones to beadazzle the Infinity Gauntlet. And that's where the high-minded, would-be critical sophisticate has to land either on the side of innovation and artfulness or on the fun-comes-first side. It's not really that much different than assessing the Marvel films themselves. A love for the characters or for top-shelf superhero action can override even the snooty sensibilities of even the most critical viewer reared on Cahiers du Cinema and the works of Jean-Luc Godard. I've found that I've arrived at the more forgiving end of the spectrum with this title because I'm a long-time Marvel Comics enthusiast and I'm just delighted that the central game components of this title are a giant Infinity Gauntlet that you actually mount the Infinity Stones onto and a board-in-the-round where a huge plastic figure of Thanos spins around to determine which of its three sectors are where he is going to clobber the heroes. I love that Black Panther and not Iron Man is the leader of the "tech" heroes and that Loki is a hero card (at least for now). I like that I can form a team of Doctor Strange, Bucky Barnes, and Rocket Racoon and stick them in a Quinjet. And it's a dice game, which I tend to like, so there is tons of press-your-luck reroll drama and a few important decisions. It's also extremely easy to set up and play in a 45-60 minute timeframe. And to put sprinkles on it, my kids (6 and 8) love playing it. Each turn, you kick off by rolling a pair of Thanos dice. These determine which way he turns and also which progress track gets a cube among the Infinity Stones. Once he's done his thing, Thanos attacks every Hero card in the sector he is pointing at, placing a damage cube on it. If there are villain cards there- say, Proxima Midnight, Corvus Glaive, or a General Outrider)- they impact Thanos' attack, usually making it worse. There are three card positions in each of three sectors, which could be Asset cards for the heroes or those villains. If a player has their team's marker in the sector, any heroes they have on their team are also hit. Thanos is trying to either complete the Gauntlet (with each completed stone activating a negative event for the heroes) or to KO a number of heroes over the course of the game. The heroes, of course, are trying to stop this from happening by defeating a set number of villain cards. But you'll need help, so you must also recruit assets. You do both the same way. After the Thanos phase, you can move your team marker or stay where you are, depending on which assets you want to go for or villains you want to battle. You get to roll four dice as indicated on your team base card. Red are more combat-oriented, Blue are tech, green are mystical, and black is cosmic. Any assets you have may give you conditional bonus dice, let you change dice faces, heal damage, or perform other special functions. Once you roll, you must assign at least one die to a card in your present sector. Then you can reroll, and again assign at least one. This continues until you either have no dice remaining or you can't place a die. Any cards you have met the requirements for you can recruit. Villain cards take a damage marker and you also get a bonus tile, which could be a free die result or other one-shot special ability. It's a game of picking your battles and forecasting success. Placing a die on a card is like placing a bet, and you will invariably find yourself down to your last die, hoping for the result you need to get Thor on your team or to finish off a villain that has caused the good guys grief. Early in the game, this can be quite challenging, and it can take a little while for the game to really get moving and for more complex decisions to develop. When dice pools are larger in the late game, smart play means placing results across two or even three cards in the sector to ensure some kind of success. Difficulty can be all over the place and impacted by player count, which is a demerit. It's just a fun but really pretty repetitive game- there is a sense of development over the course of play, but the narrative line is very weak. Storytelling isn't the priority here, and it is most definitely not an adventure game. It's also somewhat uninspired and routine. Anyone familiar with pretty much any dice game released in the past ten years or so will recognize some core concepts. In particular, I was very much reminded of Doctor Who: Time of the Daleks, but this is really a simpler game than that with a few less subject matter bells and whistles. There also isn't really any particular mechanic that raises an eyebrow or gives me that "huh, that's really cool" moment I savor in encountering a new design. In a word, it's very workmanlike. But is that really a fault when you've enjoyed your time with a game? There is much to be said for a solidly designed, appealing game with a good setting and neat components. The three groups I've played with (including my kids) have all come away satisfied if not particularly blown away by it. Like most of the upper-middle tier Marvel movies, it comes across as good, high quality entertainment that can please a crowd but it falls short of being something award-winning, remarkable, or timeless. I agree, Thanos is fun, but not remarkable. I did enjoy it more than Doctor Who: Time if the Daleks. I do think it is overpriced. I wouldn’t pay more that $25 for it. ubarose wrote: I agree, Thanos is fun, but not remarkable. I did enjoy it more than Doctor Who: Time if the Daleks. I do think it is overpriced. I wouldn’t pay more that $25 for it. Sounds like it will be a stupid price in the UK then so I probably won't even consider buying it for a year or so when all the unsold stock goes in the fire sales (just like Risk: Star Wars can now be found here for under £20 when it came out at £48). Mike - if you didn't have a couple of little'uns to play with would this get many replays in your groups, and same question if someone wasn't a MCU historian or fan ? Uba - would it get many replays in your groups ? And, this game vanishes out of memory....Thanks, Thanos. Yeah, it would get played as like a King of Tokyo alternative. If our main game ends early we will pull out a short easy game to end the night, and all the dudes I play with are into Marvel. I’m like you. I’ll wait and see if it ends up on clearance. This game looks perfect for my kids, especially the youngest who would struggle with most of the games I play with her brothers. It looks fun for what it is - and I'm not one to dismiss a well-executed dice game after playing crap like Dungeon Roll - but there's no way I'm dropping $50 on it. Edit: MSRP is $50 but the price is more like $36-$37 online. Still too pricey for me. Just had a look at what's in the box and there's bugger all, I doubt I'd even drop £20 ($25) on it. ubarose wrote: ...Thanos is fun, but not remarkable. ...I do think it is overpriced. I wouldn’t pay more that $25 for it. I strongly agree with this sentiment. The rent's just too damn high. Southernman wrote: Just had a look at what's in the box and there's bugger all, I doubt I'd even drop £20 ($25) on it. Did you see the SIZE of that THANOS figure? It's Ginormous! I don't know about that cover art. Seems like the game should be named "Thanos Constipated."